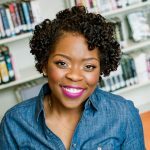 Assistant Professor of Communication Shardé Davis is the 2018-19 recipient of the American Fellowship for Postdoctoral Research Leave awarded by the American Association for University Women (AAUW). The primary purpose of the Postdoctoral Research Leave Fellowship is to increase the number of women in tenure-track faculty positions and to promote equality for women in higher education. This fellowship is designed to assist the candidate in obtaining tenure and further promotions by enabling her to spend a year pursuing independent research.